Radiology orders continue to be a challenge for most health care organizations. What’s the right way to proceed when an order does not match the study that should be performed for the patient? Unfortunately, the answer, as with most complex compliance issues, depends on several factors. Given the number of payers, insurance plans, hospital guidelines, and local, state, and federal regulations, it is impossible to have a one-size-fits-all solution—unless it is an overly conservative one. It is important to remember that the Centers for Medicare & Medicaid Services (CMS) guidelines for independent diagnostic testing facilities/physician offices vary from hospital guidelines. However, many private payers do not differentiate their guidelines based on the place of service. Individual payer requirements for orders vary significantly, and it is important to incorporate a method for addressing these variations. While this article will focus on the CMS and private payers in a broad sense, practices must bill per individual payer guidelines. The CMS has published specific rules in the Medicare Benefit Policy Manual (chapter 15, section 80.6) for the ordering of diagnostic tests (www.cms.hhs.gov/manuals/Downloads/bp102c15.pdf). The requirements for any services ordered in a hospital are spelled out in the Medicare Hospital Conditions of Participation (COP), which can be found in 42 CFR §482.26(b)(4) and state that services “must be provided only on the order of practitioners with clinical privileges or, consistent with state law, of other practitioners authorized by the medical staff and the governing body to order the services.” This means that all services provided by the hospital must have an order in the patient’s medical record, and the order must match what was provided. However, a 2011 Office of Inspector General nationwide audit of emergency department patients found no order in the medical record for 12% of the MRI and CT exams and 9% of the X-rays. They recommended that Medicare request its money back on all of these services. Second, the COP state a practitioner with clinical privileges, or another practitioner allowed by state law and authorized by the medical staff and hospital governing body, must order services. As long as the hospital governing body has authorized radiologists to order services for patients, then the order is valid under the COP. All orders for diagnostic tests must be medically necessary; therefore, if an order is changed from what was originally requested, the medical necessity of the change also must be documented to support the revised order. For example, a thoracic spine CT scan without contrast was ordered on a trauma patient with a midback contusion. Upon evaluating the patient, the medical staff determined that the patient had previously undergone back surgery, so the study needs to be performed with contrast. The radiology report should explain the reason for the change. This revised order must be authorized by the ordering physician or, if allowed by the hospital governing body, can be authorized by the radiologist. Regardless of the authenticating physician, a revised order must be obtained so that the study performed matches the study ordered. We know that the guidelines exist, so what are the exceptions? Sometimes it is easier to discuss what you can do as opposed to what you can’t. For Medicare, if an order does not specify the exam protocol—for example, the number of views or whether contrast can be used—the radiologist may make this determination based on the patient’s clinical indications without notifying the referring physician. This is usually referred to as a test design decision. While official national Medicare guidelines allow this, some facilities have implemented policies that require a new order if any clarification and/or change is needed, including contrast use. Technically, you can make the change according to Medicare, but if your facility requires a new order, you must obtain one to ensure compliance with your guidelines. The radiologist also may change an order when it contains an error that would be obvious even to a layperson. For example, if the treating physician orders an X-ray of the left ankle to check the alignment of a patient’s fracture, but the right ankle is fractured, the facility can perform a right ankle X-ray without contacting the referring physician. Again, this is a Medicare allowance that may not be allowed by private payers and/or hospital guidelines. 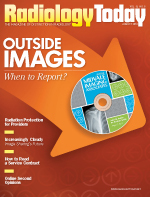 Your imaging staff needs to know the different payers’ guidelines. If the patient’s condition will not permit the exam to be performed as ordered, the radiologist may cancel the exam without notifying the referring physician. Any medically necessary “scout” images, such as a single view of the abdomen prior to a barium enema study, are billable. There also is an exception to the ordering rules when the radiologist determines that an additional exam is needed due to an abnormal result, but the treating physician is not available to provide an order for the additional exam. There are detailed requirements for providing and documenting the additional service, which are included in the Medicare Benefit Policy Manual. Finally, the facility does not need a new or revised order to perform an exam that the treating physician conditionally ordered. For example, if a physician orders a diagnostic mammogram to be followed up with a breast ultrasound if clinically indicated, you do not need an updated order if it is determined that the ultrasound exam is necessary. If your system does not have the capability for physicians to place conditional orders, updating your internal exam code to the conditionally requested study would not be considered an order change. If your computerized physician order entry requires that you update the order to the conditionally requested study, you should verify that the original order with the conditionally requested study remains in the system. Most commercial payers require that diagnostic exams such as CT, MRI, and PET be precertified (sometimes referred to as preauthorization). It is the referring physician’s responsibility to obtain this precertification by contacting the payer and providing the medical reason for the exam, a function typically performed by their nursing staff. Upon approval, the payer will issue a precertification/preauthorization number, which must be submitted by both the facility and the interpreting physician. If the payer refuses to approve the exam, neither the facility nor the physician will be paid for it regardless of the findings. Note that the referring physician must obtain the approval because he or she owns the patient’s medical record and therefore should have the documentation to support why the exam was ordered. If the referring physician is part of your organization, then there is a shared medical record so, in most cases, the facility can obtain approval. If the referring physician is not part of your organization, then the situation is more tenuous. Make sure that the payer clearly understands who is obtaining the approval. Otherwise, an argument could be made that you are financially incentivizing the referring physician to send patients to your facility since you are performing their work function. The precertification number provided by the payer is based on the performance of a specific exam and is most frequently approved on a CPT procedure code basis. If the facility and physician do not submit the exact code that is approved, then payment may be denied since the claim does not match the precertification information. Some payers will approve a range of codes instead of just one code; however, this practice is not widespread. For example, a payer might approve codes 70551 to 70553 (MRI of the brain without contrast, with contrast, and with and without contrast) instead of just 70551 (MRI of the brain without contrast). Regardless of whether the correct code or range of codes was approved, if the referring physician requests an incorrect exam, no changes can be made without first contacting the referring physician’s office and obtaining a new order/precertification. Failing to do so could result in loss of reimbursement for both the facility and the physician. For commercial payers that do not require precertification, there may be some flexibility in the changing of orders; however, it is difficult to track this information on a departmental level. This is a primary reason why most facilities have chosen to implement a standard policy that treats all payers the same and does not require the technologist to review financial data. Keep in mind that individual payer guidelines always prevail, and navigating these guidelines continues to become more challenging. Therefore, it is important that your management evaluates who is responsible for ensuring correct orders and that you don’t inappropriately overburden your clinical staff with this heavily administrative responsibility. There is great value in having clinical staff review the orders, but that does not translate into giving them the primary responsibility for obtaining correct orders. While we would really like this to be a clear-cut issue, it is not. Management needs to ensure that the appropriate staffers are consistently addressing any issues related to orders with your referring physicians, radiologists, and clinical staff to avoid lost revenue and compliance problems.